A beautiful dwarf tree, it makes a wonderful feature tree for home gardens. Forms a dome shape of waterfall foliage whilst bright-golden furry catkins liven things up in the spring time. Ideal for growing in the ground or in containers that can be moved into position on a patio, terrace or even a balcony. A stunning solution to creating instant impact in a small space. Supplied as a 3L potted plant approx. 75cm tall plant in standard form, ready to plant out. 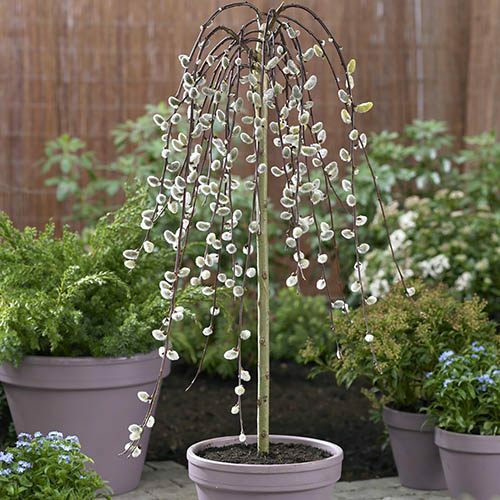 A wonderful feature tree for home gardens, the Salix ‘Kilmarnock’ is a beautiful dwarf tree with waterfalls of dark-green leaves smothered in golden catkins in the spring. Forming a dome-shape, like a beautiful waterfall centrepiece, the long stems hang and gently wave in the breeze throughout the year, whilst bright-golden furry catkins liven things up in the spring time. Ideal for growing in the ground or in containers that can be moved into position on a patio, terrace or even a balcony, this dwarf tree will stay compact and neat but bring a real unique feature to even the smallest of gardens. A stunning solution to creating instant impact in a small space, this weeping willow will create a real talking point next spring! Supplied approx. 75cm tall in a 3L pot ready to plant out. Force blooms for cut-flower displays by cutting stems and placing them in water indoors as early as January. Water well until established - willow loves water! Apart from keeping plants well-watered, they are virtually maintenance free - even pruning is simple, just prune out dead or old wood to encourage new shoots to appear. Any shoots that have grown too long can also be shortened. To keep your tree perfect, remove any unwanted shoots that emerge from the main stem or new growth from the base.